night «Suad Bejtovic Photography etc. Suad Bejtovic Photography etc. When I decided to start the 365 project, I realized I will have to recycle some of the photos I have been posting over the last 5 or so years on my Flickr page. The tougher challenge would have been to actually post a brand new photo every day for a year – and that may be something I can look into next year. 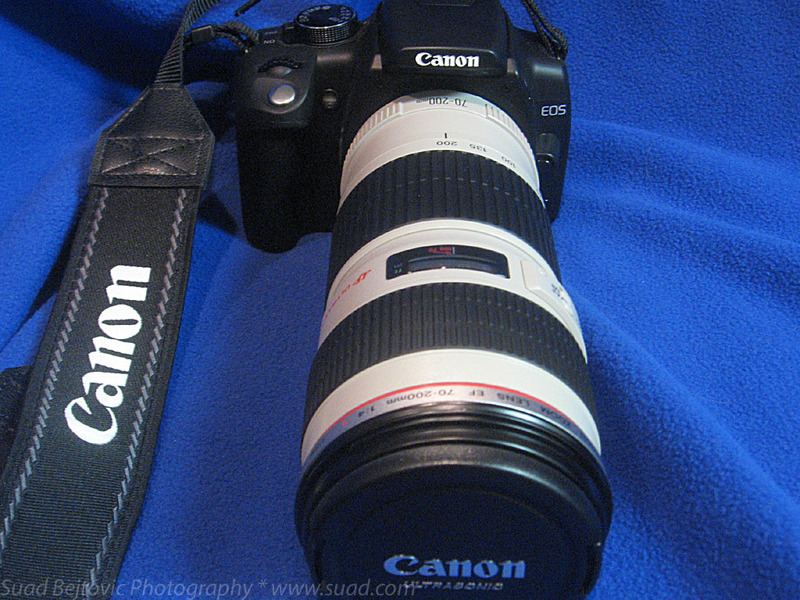 I balance that by often posting more than one photo in each blog post. 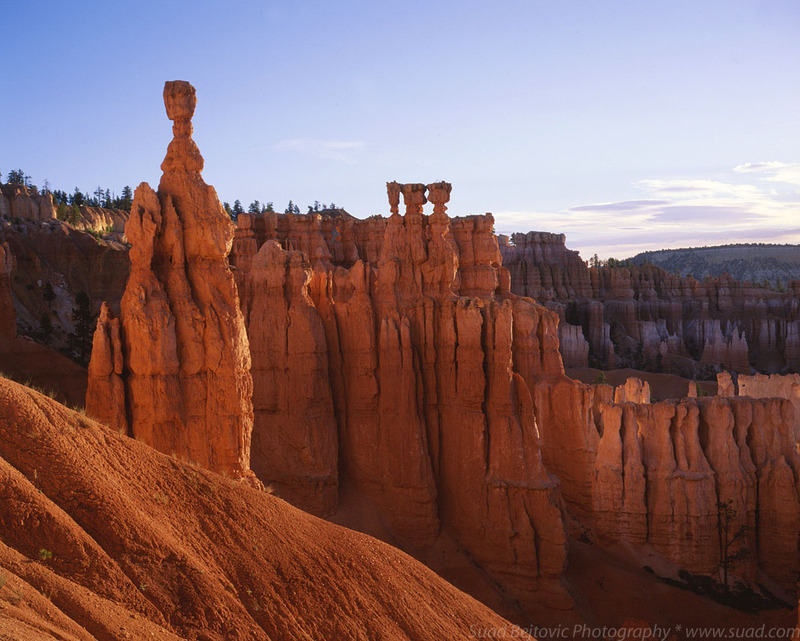 So, today, I wanted to share three photos from one of the most surprisingly magical places I visited. 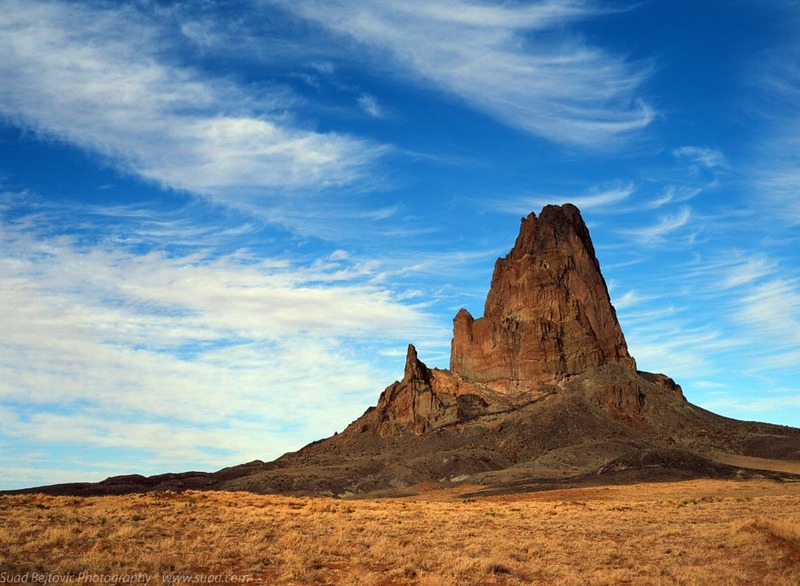 This is Agathla Peak, sometimes called El Capitan, and it is a volcanic plug just south of the border between Utah and Arizona. 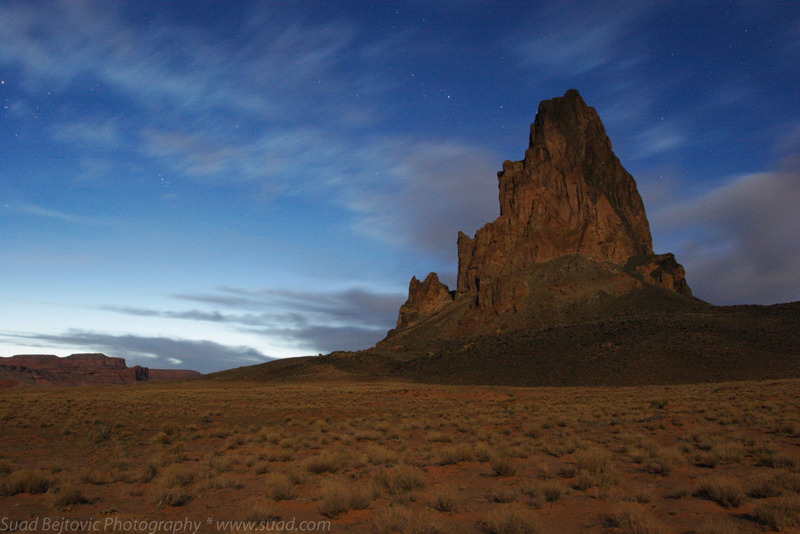 My friends John, Tyler and I were on our way to the Monument Valley a few years ago and couldn’t help seeing this fantastic piece of rock protruding from the ground. 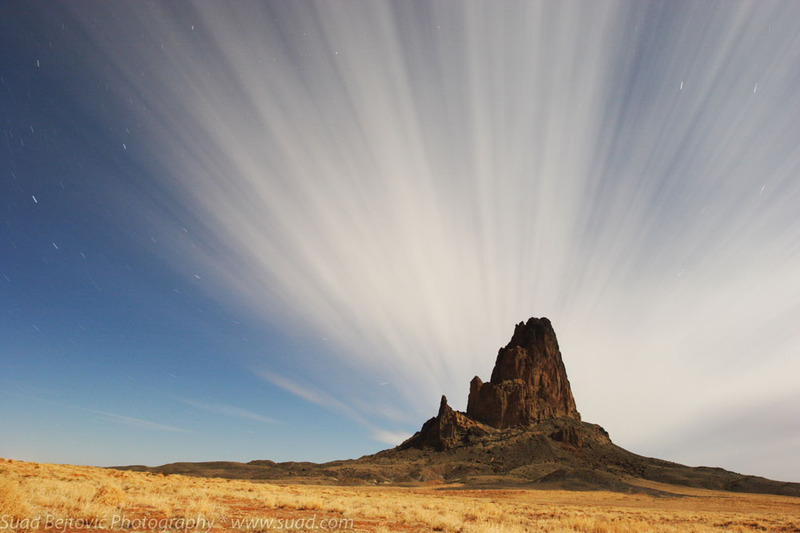 After shooting a sunset at the Monument Valley, we stopped by Agathla on our way back to Page, AZ. That’s where the first photo was made – I made it with my Canon 20D digital camera. Because I didn’t have a remote shutter release, I had to limit the exposure to 30 seconds, using the ISO of 400 and even lightening the photo in post-processing. A year later, the three of us were joined by our friend and photographer Scott; this time Agathla wasn’t going to surprise us. We made sure to have enough time to stop there in the afternoon. The second photo was shot on medium format Velvia 50 film, and you see it here pretty much the way it looks like on the slide. I was very proud of it – the composition was great and the moment captured was lovely. Just look at those clouds! Speaking of clouds, the third photo was taken later that night; the wind was moving the clouds exactly over the tip of Agathla, which became very evident on this 5-minute exposure. That’s no typo – this shot is lit by nothing except the Moon, and it took 5 minutes to get enough light to the camera sensor. 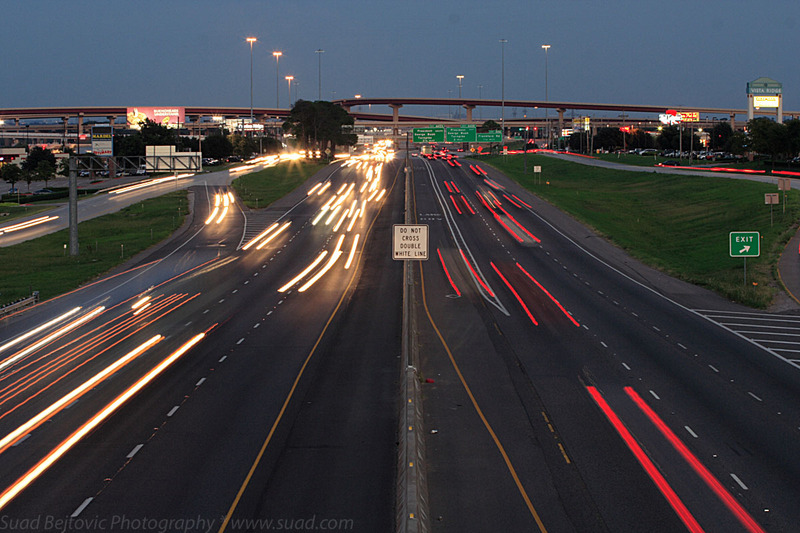 You can even see the star trails – that’s how much the stars moved while the photo was being taken. You can tell I was ready to take this photo by the fact that I bought a remote shutter release for my Canon 20D. Don’t let this rather technical post diminish the fact that this place is just fantastic. 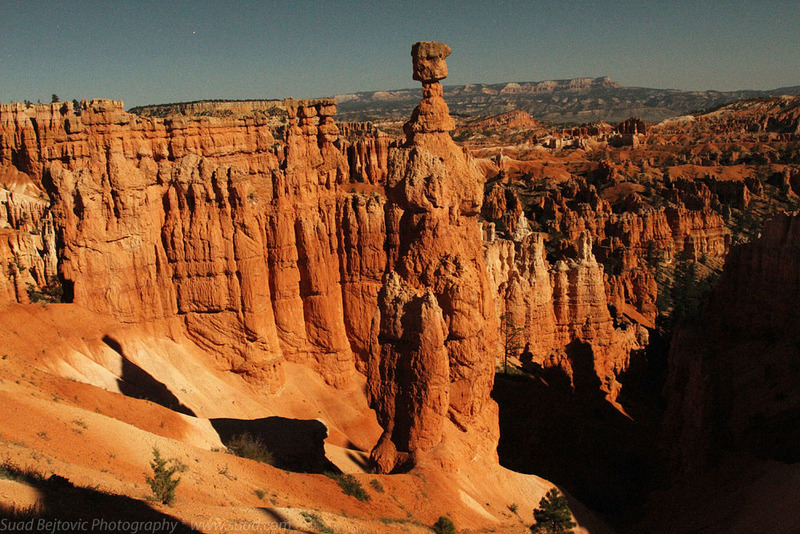 It’s nothing but a rock sticking out of the ground, but the combination of its ruggedness and the relative serenity of its immediate surroundings creates a very dramatic image, at any time of day. Or night. Yesterday, I showed you a few photos of Fontana di Trevi from my visit to Rome, Italy, and today I’m continuing Rome Week on the blog. 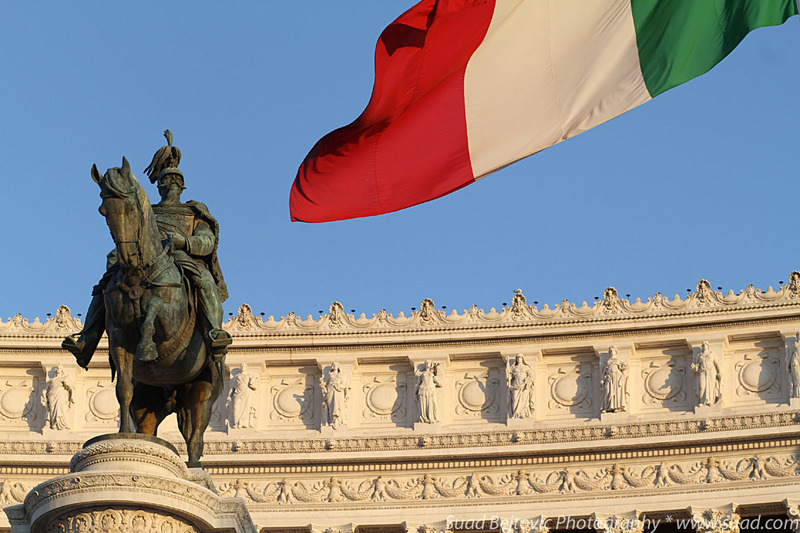 Piazza de Venezia is an enormous square right in the middle of Rome, dominated by the massive monument to Vittorio Emanuele II, made in white marble, covered in columns, statues, steps, fountains and all sorts of other embellishments. 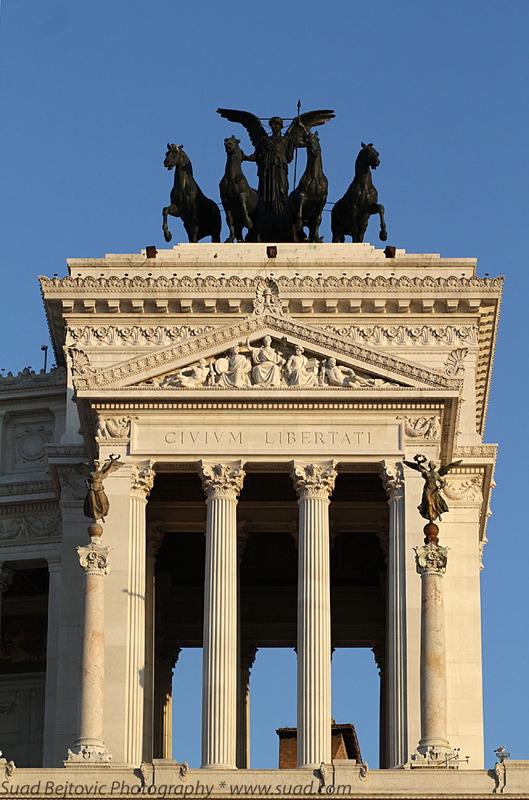 The monument is basically a celebration of the unification of Italy under Victor Emanuel. 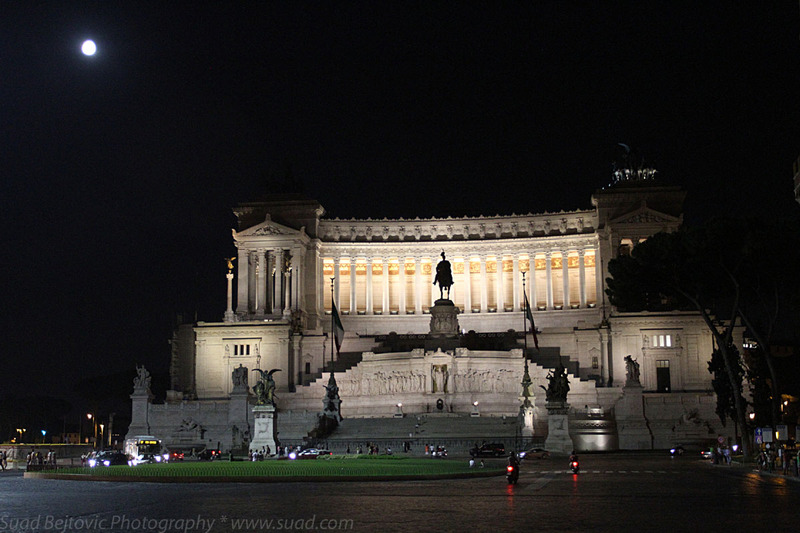 He’s the guy on the horse in the detail photo below (notice how the Italian flag unfolded into my shot just right). Since it was built on top of the Capitoline Hill, it’s visible from just about anywhere in Rome, but that’s also a cause for some controversy. The Wikipedia article even mentions some pejorative nicknames given to the monument, due to its size, color and artistic value (or lack thereof). It’s undeniable, however, that the monument is still an imposing structure. I was particularly impressed by the sculptures on each side of the roof – they represent the goddess Victoria riding on a chariot pulled by four horses. You will also see a detail shot of one of the ends of the monument, showing the columns, the inscription “Civium Libertati” (“Freedom to the people”) and one of the Victoria sculptures. The shots are inadvertently shown in the chronological order by the time of day. 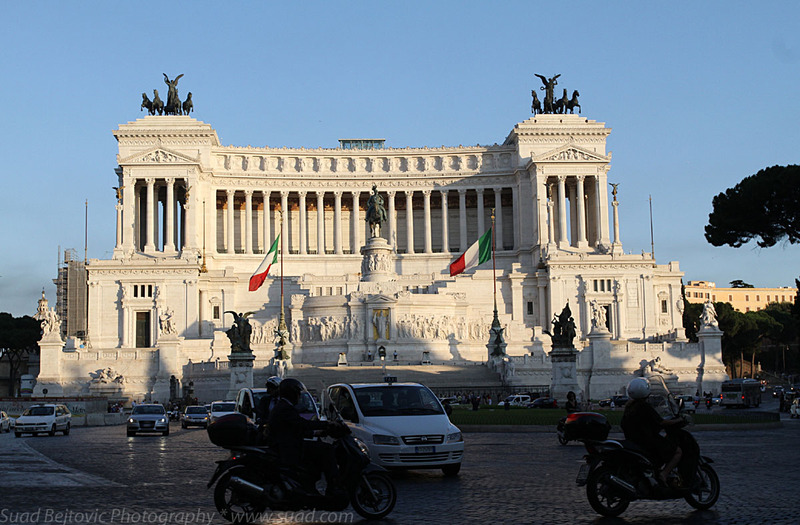 The first three were made on my way to the Coliseum; the top one is shortly upon my arrival to Piazza Venezia. I spent some time lingering at the square, so I caught the beginning of the “golden hour” of sunset, which can be recognized by the pleasing warm light on the two detail shots. The ending of this same golden hour will be shown tomorrow at another location. The last photo below was taken at night a few days later. There was a full (ish) Moon during my visit, and I was able to compose a few shots with the monument and the Moon together. The monument is very nicely lit at night, but for some reason, the Victoria sculptures were almost not lit at all – you can barely make out the one on the right side of the photo. As my Rome itinerary was pretty intense, I never got onto the monument, or inside it, but it seems that there is an elevator now that you can take all the way up to the roof. Since I said the monument can be seen from all of Rome, I can imagine that one could see all of Rome from the top of it. That definitely goes on a to-do list for a future visit. What do you think about the monument – awesome or gaudy?